You know that feeling when you really want to get out of town for the weekend, but you don’t want to break the bank? Jetsetter magazine suggests eight U.S. cities where you can enjoy yourself on a budget. San Antonio, Texas. Sure, Austin is super-hot right now, but that also makes it super-expensive. Instead, head for San Antonio. 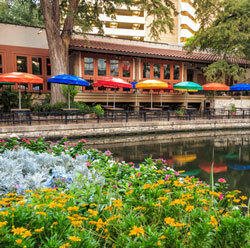 Explore the San Antonio River Walk (pictured), which teems with restaurants, bars and trendy shops. You also can visit the Japanese Tea Garden to enjoy some beauty and tranquility – for free. Baltimore. The Charm City offers lots of eateries, craft beer pubs and historic areas to explore. You also can check out the National Aquarium or catch a baseball game at Camden Yards. Or you can see the extensive collection of art by Henri Matisse at the Baltimore Art Museum, where the admission is free (though there might be a charge for certain exhibits). Kansas City, Mo. KCMO is said to have more fountains than any city but Rome, and some of the most amazing barbecue on the planet. Eat, drink and browse in the funky Westport neighborhood or in the Country Club Plaza, the country’s first planned shopping center. Check out the giant shuttlecocks on the lawn of the Nelson-Atkins Museum of Art. Then go on inside; admission is free. Philadelphia. There is plenty of history here, starting with Independence Hall and the Liberty Bell. Run up the steps of the Philadelphia Museum of Art, like Rocky. Or, for a more unusual art experience, go see Philadelphia’s Magic Gardens, the outdoor art exhibit that artist Isaiah Zagar created entirely from found objects. Tucson, Ariz. Check out the desert landscape and the giant cacti in Saguaro National Park and admire the historic architecture at San Xavier Mission. Then treat yourself to amazing Mexican food available all over town for much less than you probably expect. Providence, R.I. As the site of Brown University and the Rhode Island School of Design, Providence is home to lots of hip coffeeshops, bars and eateries. There are wine tours, distillery tours, brewery tours and historical tours to keep you busy. Portland, Maine. A hipster haven, Portland offers funky stores, coffeehouses, bars and restaurants galore, as well as a beautiful waterfront. Check out the Allagash Brewery. And of course, you can always treat yourself to the lobster dinners for which Maine is justifiably famous. Memphis. The other famous music city in Tennessee is the home of the blues, which are showcased up and down the length of Beale Street. Don’t miss the Duck March at the Peabody Hotel, when the hotel’s resident waterfowl come to the lobby in the morning and go back to their home on the roof at night. Of course, there also is the barbecue. And Graceland, the palatial home of Elvis Presley.